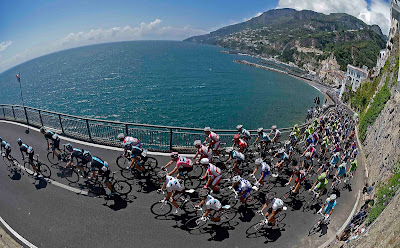 The 2014 Giro d'Italia Official Presentation will be held in Milano on Monday, October 7, the day after the 107th edition of the Il Lombardia (Sunday 6 October, from Bergamo to Lecco). Everything is ready for the great kickoff for the 2013 Tour de Pologne-UCI World Tour from Trentino in Italy; the first two stages are being held in Italy. In this evening, Friday, May 26, at the MART in Rovereto there was the official presentation of the teams with the parade of riders who are, as always, the real protagonists of the race. There will be 23 teams lined up at the start, including the 16 World Tour formations representing world cycling's elite for a total of 138 riders from every part of the world: Europe, North and South America, Australia, Asia and Africa. There will be plenty of stars in the race, including 2013 Giro d’Italia pink jersey Vincenzo Nibali and the winner of the 2012 Tour de France Bradley Wiggins. Then there's Ivan Basso, Fabian Cancellara, Michele Scarponi, Giovanni Visconti, Rigoberto Uran, Sergio Henao, Thor Hushovd and many more. For the first time the number of riders for team will be 6 as opposed to the usual 8 as required by the new pilot project of UCI designed to highlight the excitement and attractiveness of each day of racing. 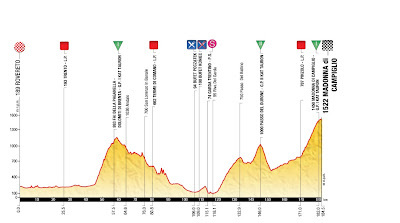 Tomorrow on Saturday, July 27th, the first stage will be the 184.5 km Rovereto-Madonna di Campiglio. Tune up your bikes, as the most glamorous edition of Gran Fondo Giro d’Italia will hit Beverly Hills on Sunday, November 3. This Italian cycling event will kick-off on swanky Rodeo Drive, before heading out to 2 routes (50 and 85 miles) throughout Beverly Hills and surrounding mountainous areas, with timed climbs to bring every rider a fun challenge. Participants will enjoy the opulent adventure of Beverly Hills while experiencing a little bit of Italy, starting with a 2-days Expo nestled in Beverly Canon Garden, located next to the prestigious Montage Hotel. The place is a natural oasis in the center of Beverly Hills: lushly landscaped gardens, rows of sycamore trees and charming garden benches, all create a fantastic must-see experience. Gran Fondo Giro d’Italia is beyond excited to bring the event to Beverly Hills, a playground to the rich and the famous known as one of the most fashionable cities in the world with its fine dining, world-class shopping, beautiful weather and perfectly manicured people and landscape. Match that with the experience of Italian cycling, the style of Italy and the mystique of the Giro d’Italia and yes, “that’s amore”. Traditional VIP reception will be a look-after event on Saturday. The hills will be alive with bikers from around the world for this quite unique edition, which echoes a very successful one in 2011, organized in conjunction with the Italian Week Celebrations. So far, thousands of riders took part to the previous editions in Monterey, New York and Pasadena. Along with the chance to encounter celebrities on your ride, you can be sure to indulge in many celebrity-style perks: the Expo at the Beverly Canon Gardens, the pasta party in a top class Restaurant at the Montage Hotel and a rich goodie bag! Be sure to reserve your spot at this exclusive event to be part of a unique Gran Fondo. Proud sponsors and partners of the Gran Fondo Giro d’Italia include: Bianchi, Vittoria, Selle Italia, Limar, Santini, Speedplay, Mezzacorona wines, Camelbak, Bicycling magazine, Gazzetta dello Sport and Interbike. As a representative of the best in Italian experiences, the event is also endorsed by the Consulate General of Italy in Los Angeles, and the Italian Trade Commission. To register and to get lodging information visit www.gfgiro.com 40% OFF with the code BH2013 only until August 7. The website for the UCI World Road Championships-Toscana 2013 has been re-designed. You can find all the latest news and information at www.toscana2013.it. In other words, all the podium finishers of the 1998 Tour were either positive or suspicious; Pantani and Ullrich positive, Julich suspicious. The Senate ordered that no results would be stripped as a result of their report. Cannondale Pro Cycling had a successful tour reflected in Peter Sagan's stage victory and winning the green jersey. Lampre-Merida had a disastrous Tour, Damiano Cunego finished 55th at 1h59'38; the best placed Lampre rider was Colombian Serpa, 21st at at 45'08". 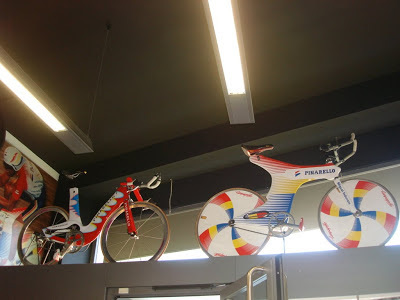 On Wednesday, July 24, 2013, a French Senate Commission is set to release a list of riders from the 1998 Tour who tested positive for EPO when the French Anti-Doping Agency (AFLD) re-examined the samples for research purposes in 2004. Marco Pantani won the epic Grenoble-Les Deux Alpes stage of July 27, 1998, a victory from which Pantani went on to win the Tour de France that year. Pantani also won the Giro d'Italia in 1998 and is the last rider to win the Tour and Giro in the same year. The following statement has been issued by the Association of Professional Cyclists (CPA); Gianni Bugno is Chairman. The CPA expresses its concern over the publication of a "list" of names of riders of the Tour de France in 1998 allegedly tested positive for EPO, due to a serious violation of fundamental rights of the riders that this publication may generate. for this publication because it would cause serious and irreparable consequences for the riders whose name is mentioned, in violation of their fundamental rights. Indeed, such a list is not reliable : the tests were performed since many years, on condition of anonymity, for purely scientific purpose and not for anti-doping control; the conditions under which the tests were realized are different from those applied for an anti-doping control, as the laboratory that performed thee tests recognized. Under these conditions the results are absolutely not guarantee d and it is impossible to guarantee the absence of errors including the nominative assignment. In addition, such a list is not accurate : the tests of that time involved only a small number of riders of the 1998 Tour de France. Under these conditions, in addition to possibly incriminate riders not doped, the list "could whiten" others who might have doped. Such a publication would be doubly unfair, unfairly condemning some riders while others would escape. Finally, the publication is itself a penalty without any right of defense. It would have undeniable and irreversible impact on the reputation of the riders complained of, and on their current and future work. And while the against-analysis seem excluded. The publication of a list would be tantamount to an accusation of doping without any possibility of defense! The CPA had asked to be interviewed prior to any decision of the Commission . The CPA note that the Commission of Inquiry met before yesterday to approve the report that will be made public next week. The CPA continues to assert that the Commission of Inquiry should not give credence to such a list by making it public in its report because such publication would bring nothing useful to the quality of its works on the subject of anti-doping, although the CPA fully supports the struggle and all the efforts to fight against this scourge. A new, exciting adventure will be offered to bike enthusiasts from all over the world, as the Gran Fondo Giro d’Italia will premier in Jerusalem on Friday, October 11 for the very first Italian-themed cycling event. 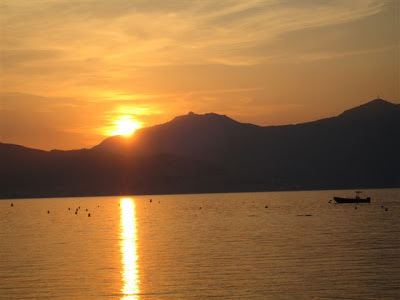 The organizers of Italy’s Giro d’Italia, the pinnacle of professional cycling, will bring the Italian passion for cycling with its energy and camaraderie to riders of all abilities with their signature format Gran Fondo. Jerusalem, a city of renowned mystical allure, is a great location for an event that celebrates the best of cycling. 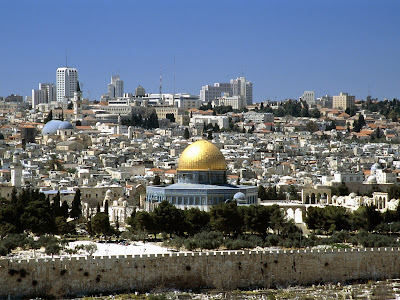 There will be three courses to choose from (20 km, 85 km and 127 km), touring the history and archeology of Jerusalem: a long course of 127 km with 3,000 meters of vertical gain and a medium course of 85 km with 2,400 meters of vertical gain, both leading also to the mountains around the city, offering incredible vistas and challenges worthy of the Giro d’italia, including timed climbs (Gran Premio della Montagna or GPM) that are part of the experience, with awards given in each category. There will also be an urban 20 km route perfect for families, children and cyclists looking for a shorter route. Expect a fantastic road service and medical support, feed zones manned by cheerful volunteers, and wonderful celebrations. Don’t forget to take a picture with the original Giro’s Trophy “Senza Fine” and meet hundreds of new friends from around the world. 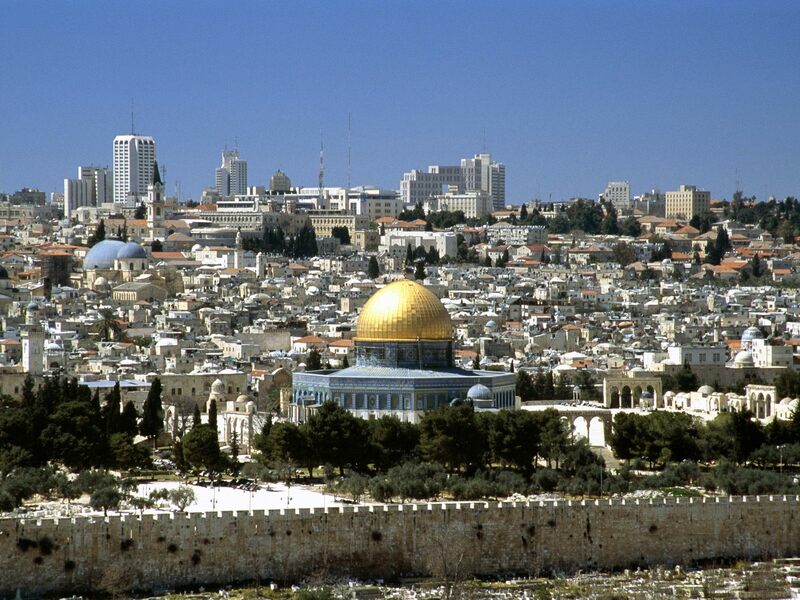 The story behind how Jerusalem became a host city for the Gran Fondo Giro d'Italia is here. 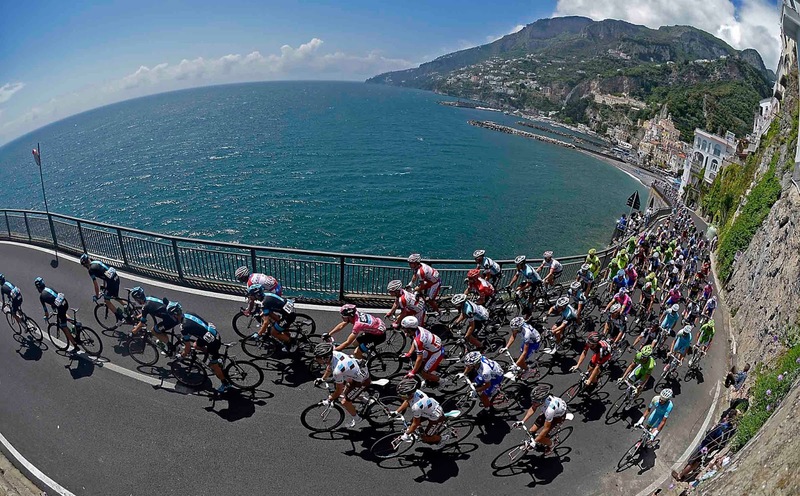 Gran Fondo Giro d'Italia events have been held this year in California (two events) and New York. After the edition in Jerusalem the following event will be in Miami/Coral Gables, Florida. Update: "Pantani, The Accidental Death of a Cyclist"
"Pantani, The Accidental Death of a Cyclist", a documentary about Marco Pantani, is going through the ratings process and its release is "soon but not yet..." according to a message from the London film production company. More about the film in this blog entry. 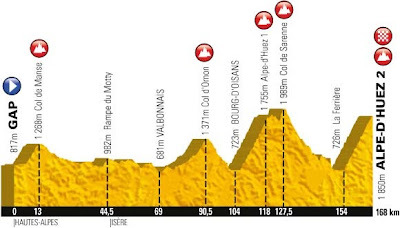 Tomorrow's stage 18, Gap / Alpe-d'Huez, 172.5 km will feature two ascents of the Alpe d'Huez. The first Alpe d'Huez stage was held in 1952 and was won by Fausto Coppi. “The former riders in my team didn't want it,” said Christian Prudhomme about the idea of staging a short stage to Alpe d'Huez in the 100th edition. The race director takes up the story of how an exciting concept was hatched. 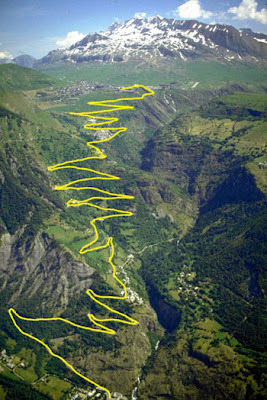 Col de Sarenne - extended descent from Proflavio on Vimeo. 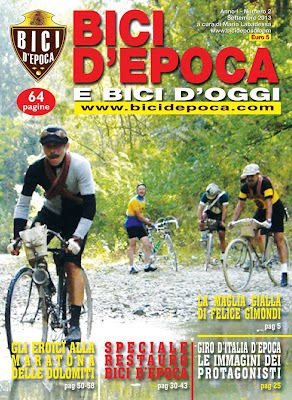 "BICI D'EPOCA e bici d'oggi" is an Italian language publication focused on vintage cycling events, bicycles, restoration, etc. 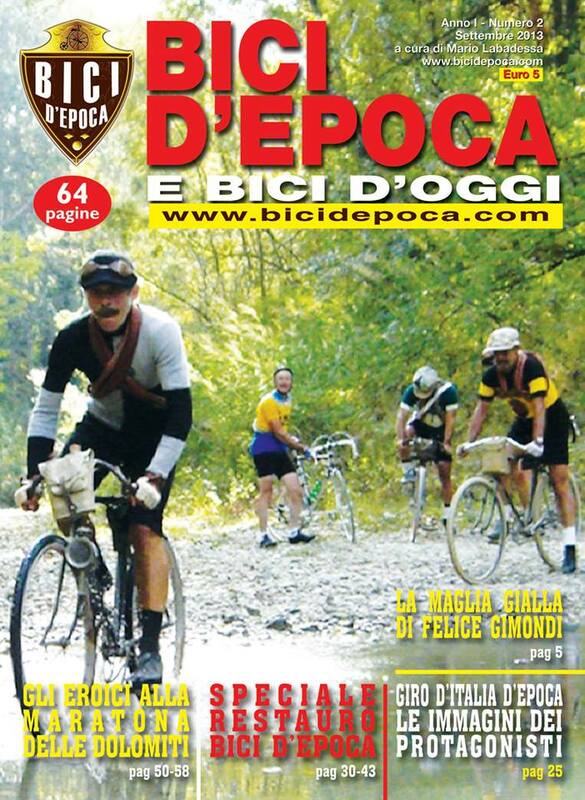 There is no subscription available, issues must be ordered by emailing segreteria@bicidepoca.com. Unfortunately, for the time being purchase is only available via the Italian PostePay system but perhaps that may change. 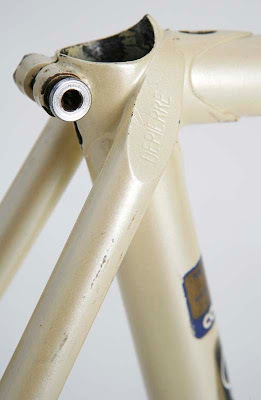 Information about the new internal EPS battery, new cranksets, wheelsets, cassettes, have been posted here. 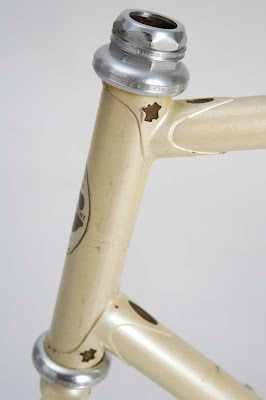 My frameset is a "Tour de France Special" made later to commemorate that victory with the outline of France hand-cut into the sides of the headtube lugs and ovals into the tops (whereas Depierre used ovals on the side of the lugs as above).All of Depierre's frame were custom made. 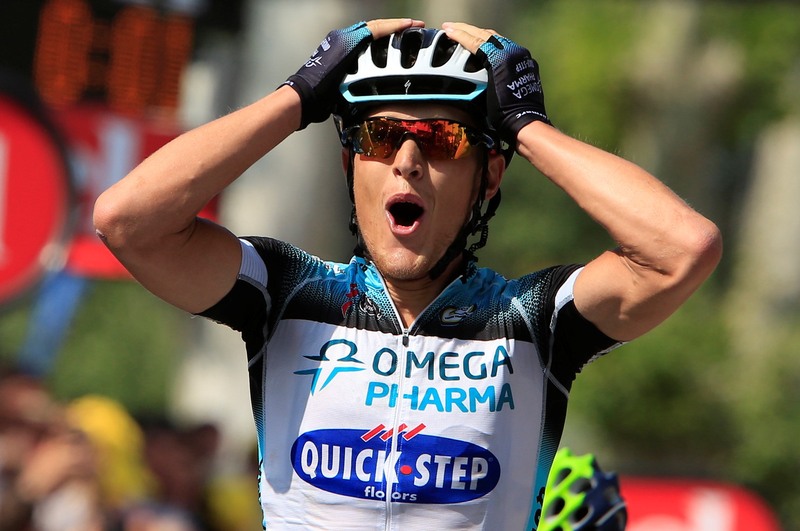 Matteo Trentin (Omega Pharma-QuickStep), in his second year as a professional and in his first Tour de France, won stage 14 in a sprint finish in Lyon. It was the first Italian stage victory in the Tour since Alessandro Petacchi in 2010. Trentin used his experience as the second to last leadout man for Mark Cavendish in his own sprint to victory as a group of 14 had come to the finish of the 14th stage after being on the attack for 150km. "With Mark we always plan the sprint before the race," Trentin said. "Every time we plan, so I have to start from this point, and arrive at that point. Gert has to start from that point and bring Mark to, I don't know, 250 or 200 meters. The thing we always say is 'be calm and wait for the right moment.' Today, I just waited for the right moment. Because I saw the wind, and everybody that started before me in the sprint for sure would come back because it was too strong to make a longer sprint than 200 meters. I just waited because I knew that my good sprint is 200 meters or less. When I saw the 200 meter marker, I started and that was the key of my sprint today." Trentin continued, "After two years of professional cycling, I’ve tried almost everything. I did the Classics, I did the Giro earlier this year. For sure, I love the Classics but I think I have to grow more to be sure if I’m to be this rider or that rider. We can see in a few years." Tomorrow, on Bastille Day, more than 500,000 spectators are expected to line the finishing climb of Mont Ventoux. It will be only the 15th appearance of the "Giant of Provence" in the Tour's 110 year history. 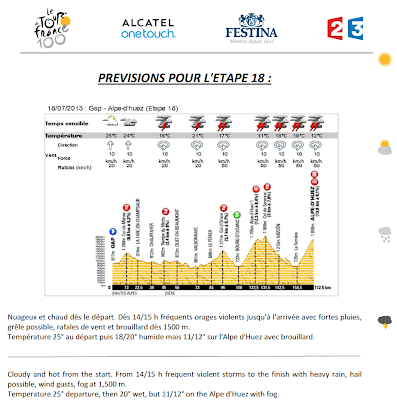 Stage 15 will also be the longest of this year's Tour, 242.5km and the highest at 1,912m. Six times a stage has crossed Mont Ventoux, only once won by an Italian rider: Eros Poli in 1994. 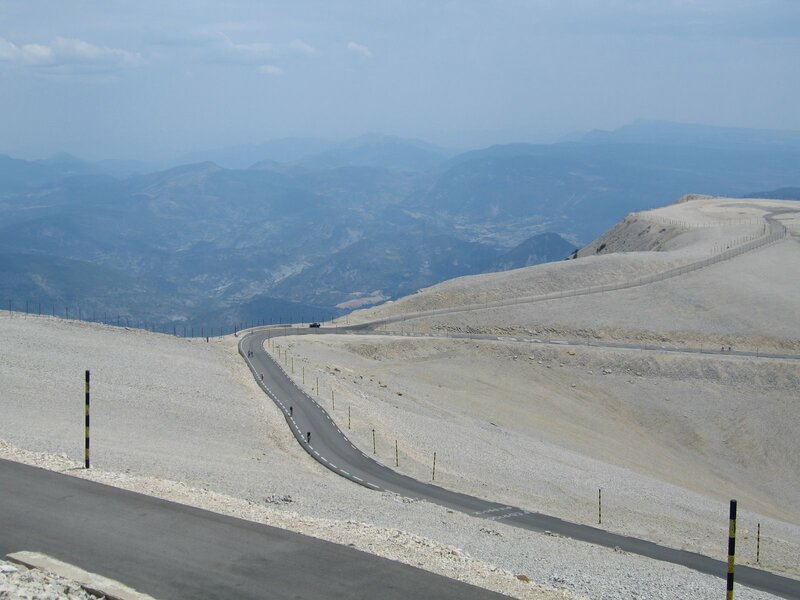 Eight times a stage has finished at the summit of Mont Ventoux, only once won by an Italian rider: Marco Pantani in 2000. Tour de France's view of tomorrow's stage: "This stage is the longest of this 100th Tour. 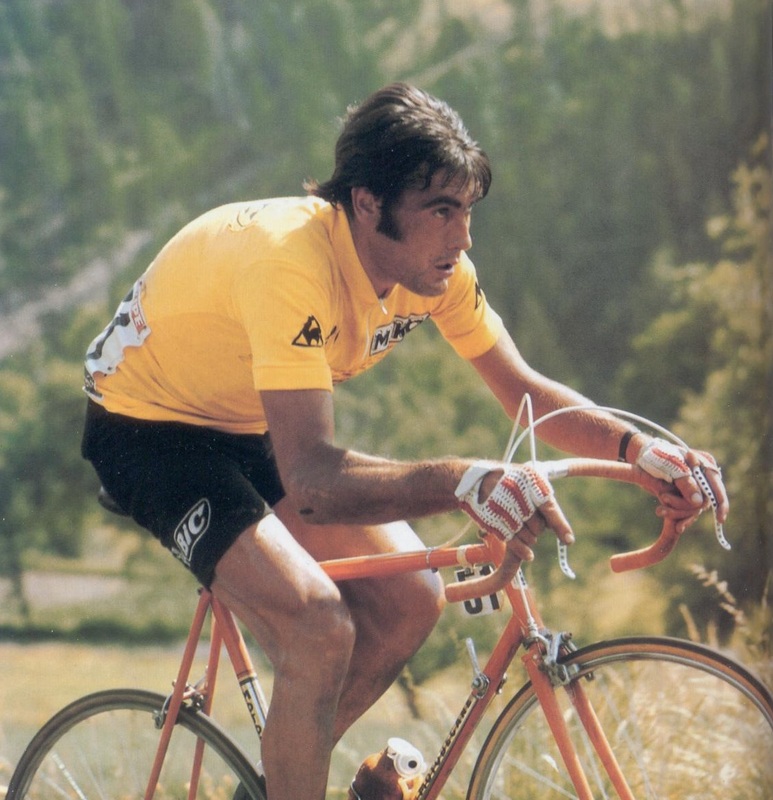 It is also one of the most prestigious because nobody wins by chance on the Ventoux, especially not on 14 July? There are two scenarios: either a group gets away from a long way out and maintains enough of an advantage for the escapees to fight it between themselves; or the leaders shut down the race as far as the foot of the climb, transforming the stage into one enormous hill-climb! Depending on the weather, a lot of damage could be done today. Imagine what it could be like if there's blazing heat all day? 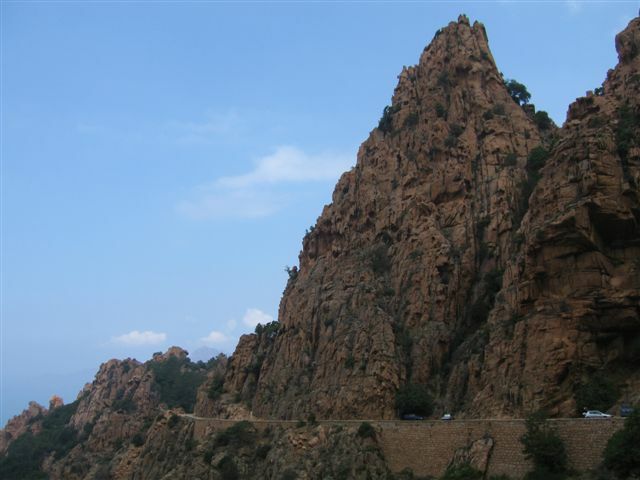 Whether you're in the yellow jersey or not, if you do badly on this climb you will lose a quarter of an hour!" Back on July 5th we wrote a piece entitled, Why There Isn't a Women's Tour de France. With no apparent move or discussion towards re-instating one, Marianne Vos, World & Olympic Champion and Emma Pooley, Olympian & World Champion, and other cyclists, are now petitioning Christian Prudhomme, Director of Tour de France, to add a women's professional field to the 2014 Tour de France. For 100 years, the Tour de France has been the pinnacle endurance sports event of the world, watched by and inspiring millions of people. And for 100 years, it has been an exclusively male race (there was a separate Tour Feminin in the 1980s, but it lacked parity, media coverage, and sponsorship). After a century, it is about time women are allowed to race the Tour de France, too. While many women's sports face battles of inequity, road cycling remains one of the worst offenders: fewer race opportunities, no televised coverage, shorter distances, and therefore salary and prize money inequity. We seek not to race against the men, but to have our own professional field running in conjunction with the men's event, at the same time, over the same distances, on the same days, with modifications in start/finish times so neither gender's race interferes with the other.The women's road race at the London Olympics was a showcase for how impressive, exciting, and entertaining women's cycling can be. The Tour of Flanders and Flèche Wallonne hold similar top ranked men's and women's races on the same day, with great success. Having a women's pro field at the Tour de France will also create an equal opportunity to debunk the myths of physical "limitations" placed upon female athletes. In the late 1960s people assumed that women couldn't run the marathon. 30 years on we can look back and see how erroneous this was. Hopefully 30 years from now, we will see 2014 as the year that opened people's eyes to true equality in the sport of cycling. If you'd like to see more women's road racing on television and from the roadside, please sign this petition to call for road cycling to take a major step in the right direction. Help us break down the barriers that unjustly keep female athletes from the same opportunities as men. We respectfully request that a women's professional field is added to the 2014 Tour de France, and we will work with the ASO to show how such parity is smart, just and lucrative for all parties concerned. 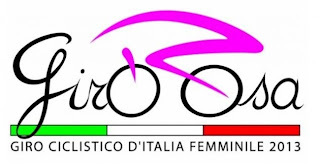 The women's Giro d'Italia, now "Giro Rosa" and before that "Giro Donne", was first held in 1988 and has been held continuously with the exception of 1991 and 1992. The "Italy Cup", which will determine the Italian championship team, recommences on Sunday with the Giro dell’Appennino. The winning team of the cup, under last year’s agreement between the Italian Cycling Federation and RCS Sport, will automatically earn a Wild Card place for the 2014 Giro d’Italia. The situation, however, could change much before the end of the season with 17 events more events from July to October for teams to pick up points in (listed below). 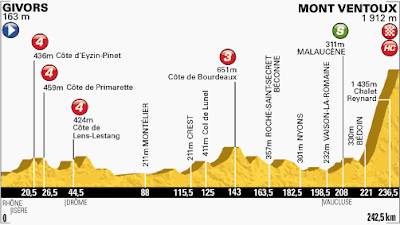 Tomorrow is the 33km time trial from Avranches to Mont-Saint-Michel. Before the stage be sure to read a special in L'Equipe in English, Clock Hunters, the story about time trial specialists and the special bicycles used in this discipline. The story begins with reference to the Pinarello Espada, pictured below (right) at the Pinarello shop in Treviso. Despite Tony Martin's crash on the first day, he has been recuperating (on the bike) and is the favorite. The best Italian time trialist, Adriano Malori, didn't make it to tomorrow's stage having withdrawn on stage 7. Daminao Cunego, the best hope for a high GC placement, had a disastrous stage 7 saying afterwards, "Not a good day for me, I was aware on the Col du Pailhères that my aims for the overall classification were over. Now it's time to focus all the energies in trying to battle for a stage victory". He finished 14'27" to Froome. I think his grand tour ambitions must be close to an end. Roberto Ferrari and Daniele Bennati are the best hopes for a sprint stage victory but I don't envy them their task with Cavendish, Kittel, Greipel and Sagan all looking for more victories. There was a double celebration in Cremona for the big finish of the 24th edition of the Giro Rosa. Dutch Ellen Van Dijk (Specialized Lululemon) finished first, ahead of American teammate Evelyn Stevens and Australian Shara Gillow (Orica Ais). "I was the favorite for this stage, but the end of a stage race is always unpredictable. I’m so happy that I achieved my goal," commented the time trial specialist Van Dijk whose team won the 2012 Time Trial World Championship. The 16.7 km circuit from Atleti Azzurri d’Italia Square to Stradivari Square didn’t change the General Classification led by Mara Abbott (USA National Team). The 27-year-old rider from Boulder, Colorado,who won the Maglia Rosa in 2010, beat Italian time trial champion Tatiana Guderzo (MCipollini Ale Galassia), who had to be content with a second place, and overcame German Claudia Hausler (Tibco To The Top), 2009 Maglia Rosa, who finished third on the podium. 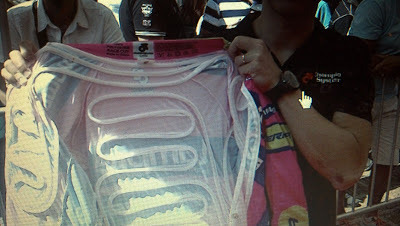 The Maglia Rosa and best climber of this 2013 Giro Rosa commented on her victory: "I can finally say I managed to do it! Thanks go to my team, the public and all those who believed in me. 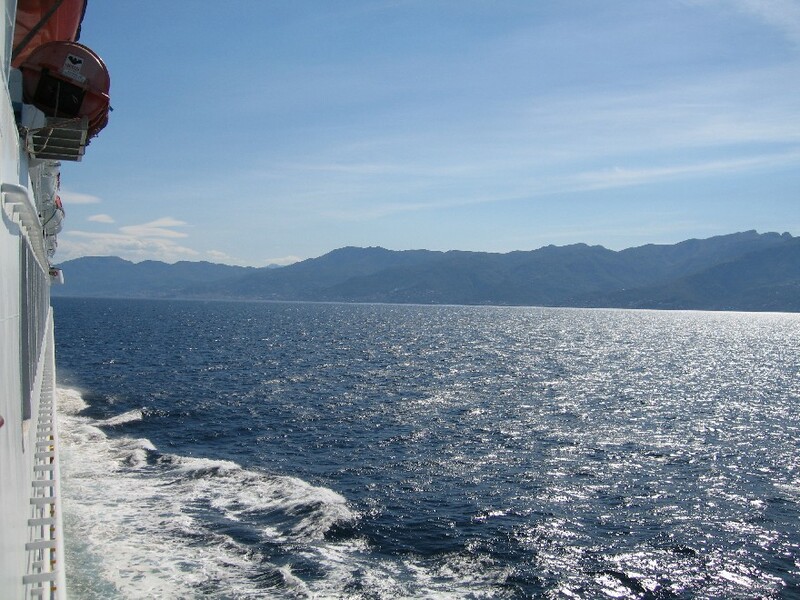 Now, I’ll have an ice-cream, pack my stuff and fly back home, where I’ll celebrate with my family and friends. I’ll be back to the Giro to try to be the best once again and to feel the warmth of the Italian fans." Marianne Vos, 3-time stage winner and leader of the Points Classification, will meet Abbott and the other big contenders at the World Championships in Tuscany: "I am really satisfied with my Giro performance and I want to thank all the organizers of the most prestigious women’s international race, who managed to create an amazing edition. As always, I tried to do my best to honor this great event. See you again in September in Italy." Tatiana Guderzo will also be at the World Championships in September. She finished second in the General Classification and won the blue jersey (best Italian rider): "Like every Giro rider I was dreaming of taking the Maglia Rosa, but I am really satisfied with my final result. I also want to thank my teammates and race director Rivolta for their hard work. It was really a great Giro!" During her first official press conference, Francesca Cauz, the best young rider, explained: "I worked hard to win the white jersey. I really wanted to take it but now it seems incredible that it is mine. I see my future all in pink. I have to improve my time trial performance, but this year’s results make me confident for the future." 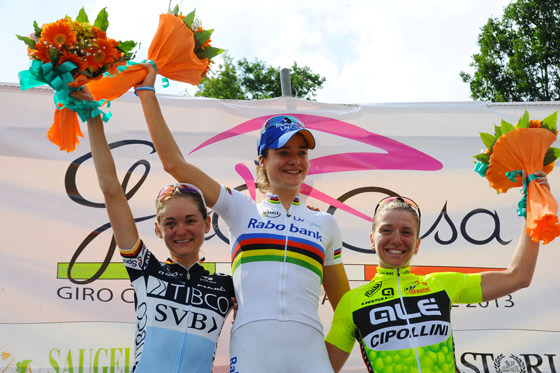 It was a superb event for the 127 cyclists who rode the 8 stages of the 2013 Giro Rosa. Satisfied with the success of the event race director Giuseppe Rivolta said: "Thanks to all the riders, my staff, the sponsors, the policemen, the journalists and the photographers and TV. We will see you all again next year for the 25th edition, which will be commemorated and celebrated in style." 2. Stevens Evelyn (Specialized Lululemon) at 35"
3. Gillow Shara (Orica Ais) at 52"
4. Ferrand Prevot Pauline (Rabo Woman Cycling Team) at 57"
5. Villumsen Linda Melanie (Wiggle Honda) at 1'02"
6. Wiles Tayler (Specialized Lululemon) at 1'10"
7. Gunnewijk Loes (Orica Ais) at 1'11"
8. Van den Breggen Anna (Netherlands National Team) at 1'13"
9. Burchenkova Alexandra (Rusvelo) at 1'15"
10. Small Carmen (Specialized Lululemon) at 1'17"
1. Abbott Mara (USA National Team) in 20h30'15"
2. Guderzo Tatiana (MCipollini Ale Galassia) at 1'33"
3. Hausler Claudia (Tibco To The Top) at 2'18"
4. Gillow Shara (Orica Ais) at 3'29"
5. Stevens Evelyn (Specialized Lululemon) at 3'39"
It had to be a sprint and so it was. At the finish line in Corbetta, it was a superb sprint and stage win for the olympic and world champion Marianne Vos (Rabo Woman Cycling Team), ahead of the 2-time world champion Giorgia Bronzini (Wiggle Honda) and of the American Shelley Olds (Team Tibco To The Top). After winning stage 3 in Cerro al Volturno and stage 4 in Castelfidardo, the incredible Vos stamped her authority once again over the 120m kilometer race which featured an 8-lap circuit, closing out what was a dominant stage racing performance in front of cheering crowds. Vos: "It was a pity that I wasn’t able to battle for the Maglia Rosa this year, even though three stage wins aren’t bad at all with only one day to go from the finish of the race. I suffered on the long climbs but I gave my best every day to honor this spectacular race and the amazing public who is always ready to support us." Bronzini: "I tried to catch up with Marianne 150 meters from the finish line but she was really unbeatable. No excuses, she’s the strongest and today she really wanted to get the stage win, as she had already lost the opportunity to place well in the General Classification. Concerning my race performance, I am really satisfied to have the great stage win in Pontecagnano Faiano in the bag and I’ve already finish on the podium twice." Olds: "I was really happy today to be on the podium with champions like Bronzini and Vos. They were helped by their teams, while I had to do it all by myself. There are only 5 of us in the team now, that’s why our priority was to protect Claudia Hausler, who saved all her energy for tomorrow to aim at second place in the General Classification.". Leader of the General Classification is Mara Abbott, who easily controlled the few attacks during today’s race together with her teammates from the USA National Team. "Until tomorrow, I won’t be sure to confirm the Giro Rosa victory. I will see you in 24 hours to comment on the Maglia Rosa that I am wearing," said Abbott. During tomorrow’s individual time trial in Cremona, she will have to watch out for Tatiana Guderzo, who gained 3 seconds by winning the intermediate sprint today. The best Italian on the GC has to close a 2’28’’ gap to the USA team leader in only 16 km. It will be tough, but not impossible. The rest of the podium is still open: Marianne Vos will want to have her say during tomorrow’s time trial, she will be try to get at least a third place on the podium, where the German, Claudia Hausler, now sits. 2. Bronzini Giorgia (Wiggle Honda) s.t. 3. 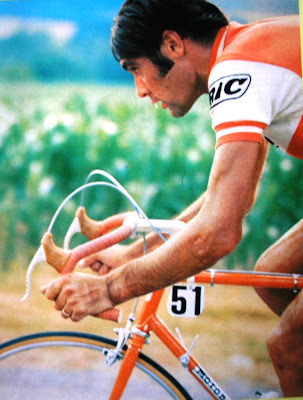 Olds Shelley (Team Tibco To The Top) s.t. 4. Wild Kirsten (Netherlands National Team) s.t. 5. Guarischi Barbara (Vaiano Fondriest) s.t. 6. Tagliaferro Marta (MCipollini Ale Galassia) s.t. 8. Amialiusik Alena (BePink) s.t. 9. Borgato Giada (Pasta zara Cogeas) s.t. 10. Hoskins Melissa (Orica Ais) s.t. 1. Abbott Mara (USA National Team) in 20h06'50"
2. Guderzo Tatiana (MCipollini Ale Galassia) at 2'28"
3. Hausler Claudia (Tibco To The Top) at 2'52"
4. Cauz Francesca (Top Girls Fassa Bortolo) at 3'01"
5. Vos Marianne (Rabo Woman Cycling Team) at 4'50"
Mara Abbott has claimed her second stage win. 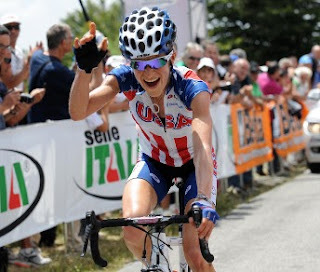 After winning the maglia rosa at Monte Beigua yesterday, the American cemented her grip on the 2013 Giro Rosa title. During the stage from Terme di Premia to San Domenico (121 km), the USA national team managed to control the race when in the first kilometers the Olympic and world champion Marianne Vos tried to attack, as well as when later in the race nine riders tried to open up a gap. The battle for the podium raged at full blast 10 kilometers from the finish line, where the Giro fans could cheer about the triumph of the USA team leader Mara Abbott, who created a gap of 24 seconds from the German Claudia Hauser (Tibco To The Top) and 34 seconds from Francesca Cauz (Top Girls Fassa Bortolo), best young rider of this Giro Rosa edition. Fourth position for Fabiana Luperini (Faren Kuota), was ousted from the race after the stage due to violation of UCI art. 1.3.019b concerning minimum bicycle weight. Finishing 5th was Tatiana Guderzo (Cipollini Ale Galassia) who is going to wear the blue jersey (best Italian in the General Classification) given Luperini's disqualification. 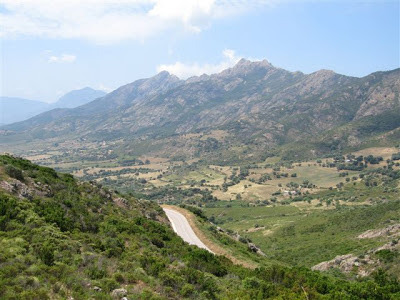 Abbott: "What beautiful mountains you have in Italy! Thanks to my teammates I could tackle the race easily and ride at my best. Today was definitely an important stage, but Cremona is still far. We still have two more stages, and everything can change." Hausler: "Mara, at the moment, is the best on climbs. I'm really happy for my second position. Finally I am back with the best ones." 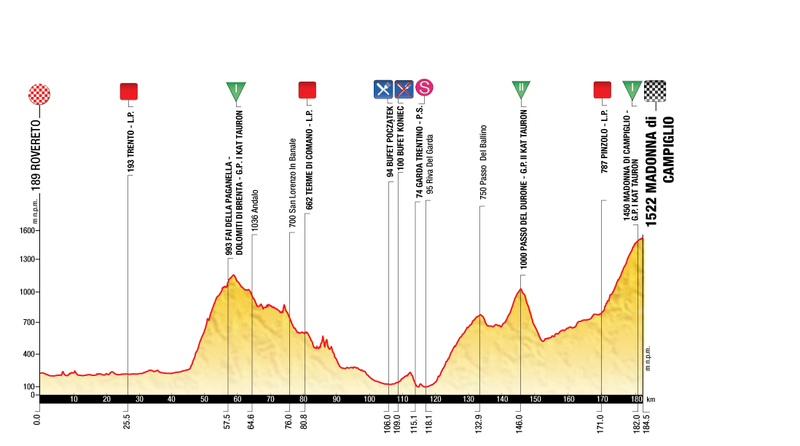 Tomorrow's stage will be totally flat, suiting the Giro's sprinters and featuring a circuit to be repeated seven times in Corbetta in the province of Milan; 120 km. 2nd Hausler Claudia (Tibco To The Top) at 24"
3rd Cauz Francesca (Top Girls Fassa Bortolo) at 34"
4th Luperini Fabiana (Faren Kuota) at 41"
5th Guderzo Tatiana (MCipollini Ale Galassia) at 1'03"
6th Stevens Evelyn (Specialized Lululemon) at 1'32"
7th Vos Marianne (Rabo Woman Cycling Team) at 1'39"
8th Gillow Shara (Orica Ais) at 1'46"
9th Moolman Ashleigh (Lotto Belisol Ladies) at 1'52"
10th Vysotska Yegvenia (Sc Michela Fanini Rox) at 1'53"
1. Abbott Mara (USA National Team) in 17h14'34"
2. Guderzo Tatiana (MCipollini Ale Galassia) at 2'40"
3. Hausler Claudia (Tibco To The Top) at 2'55"
4. Cauz Francesca (Top Girls Fassa Bortolo) at 3'10"
5. Gillow Shara (Orica Ais) at 4'50"
This film project, Half The Road: The Passion, Pitfalls & Power of Women's Professional Cycling, will be addressing this question and inequality that modern-day female riders face. The project has raised $37,500 of a needed $65,000 to proceed. There are 10 days left in the fundraising effort (please consider re-tweeting this story). There has bee a women's Tour de France (Tour Cycliste Féminin) in the past, beginning in 1984 with the last in 2009. According to wiki, "The organizers had to scramble for sponsorship nearly every year and were forced to schedule stages in cities which contributed money, regardless of their location. As a result, there were long transfers between the finish of one stage and the start of the next. Another problem in the mid-1990s involved the name. 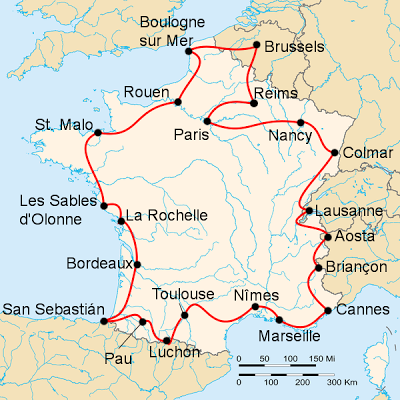 Until 1997, it was the Tour Cycliste Féminin, billed as the Women's Tour de France or the Women's Tour. The organizers of the men's Tour de France said it was a breach of trademark and in 1998 the name changed. In 2004, the race could not be held because of organisational difficulties. It returned, smaller, in 2005 and 2006. The previous tours were 10 to 15 stages; later ones had five and stayed in one region. The race was also rated lower by the UCI, and had a reduced field. In 2008, the race was six days and seven stages. However, in 2009 the race was only four days long with only 66 riders, after a planned race start and three stages in Britain fell through, leading winner Emma Pooley to joke that the race was "more of a Petite Boucle than Grande." The race was discontinued after 2009. After the subsequent termination of the 10-stage Tour de l'Aude Cycliste Féminin after 2010, the major women's stage race in France would have become the Route de France Féminine -- except that it was also canceled for 2011, leaving France without a major women's stage race for the first time since the mid-1980s". The women's Giro d'Italia, now "Giro Rosa" and before that "Giro Donne", has in the last couple of years struggled with financing but beginning this year the event is owned for the next four years, 2013-2016, by the Italian national cycling federation Federazione Ciclistica Italiana (FCI). The FCI has in turn turned over the managment of the race to race director Giuseppe Rivolta and his new firm "4 Erre". 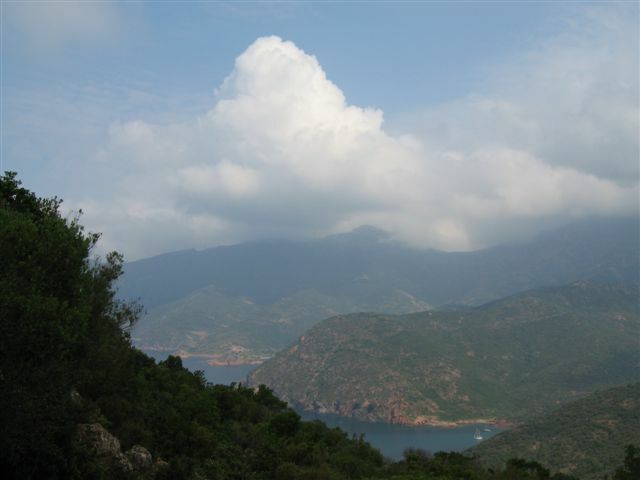 The first race was in 1988 and has been held continuously with the exception of 1991 and 1992. Marianne Vos has stamped her authority over the race once again yesterday. After winning the previous stage in Cerro al Volturno, Vos crossed the line first in Castelfidardo (AN) too. Approaching the final climb of the longest stage of the 2013 Giro Rosa, the superb Dutch rider had no rivals at all. After winning the intermediate sprint in Fabriano and taking second place at the KOM ,won by Tiffany Cromwell (Orica Ais)-, Marianne jumped ahead in a solo attack 300 meters from the finish line. The leader of Rabo Woman Cycling Team was followed by Evelyn Stevens (Specialized Lululemon), South African champion Ashleigh Moolman (Lotto Belisol Ladies), blue jersey Tatiana Guderzo (MCipollini Ale Galassia) and the German Claudia Hausler (Team Tibco To The Top). After four stages, the olympic and world champion continues to seal her leading position in the General Classification, 1'31" ahead of Guderzo, best Italian, and 1'33" ahead Hausler. Vos: "After finishing 2nd twice and winning two stages in a row, I couldn’t ask for anything better. Tomorrow, though, it’s going to be tough. There are still many kilometers to ride and many climbs to tackle before arriving in Cremona on Sunday. Winning is never easy and you can’t take anything for granted." Today is the "queen" stage, Varazze – Monte Beigua (73.3 km). Report later today. 2. Stevens Evelyn (Specialized Lululemon) at 3"
3. Moolman Ashleigh (Lotto Belisol Ladies) at 3"
4. Guderzo Tatiana (MCipollini Ale Galassia) at 3"
5. Hausler Claudia (Team Tibco To The Top) at 7"
6. Van der Breggen Anna (Netherlands National Team) at 9"
7. Luperini Fabiana (Faren Kuota) att 18"
8. Cauz Francesca (Top Girls Fassa Bortolo) a 20"
9. 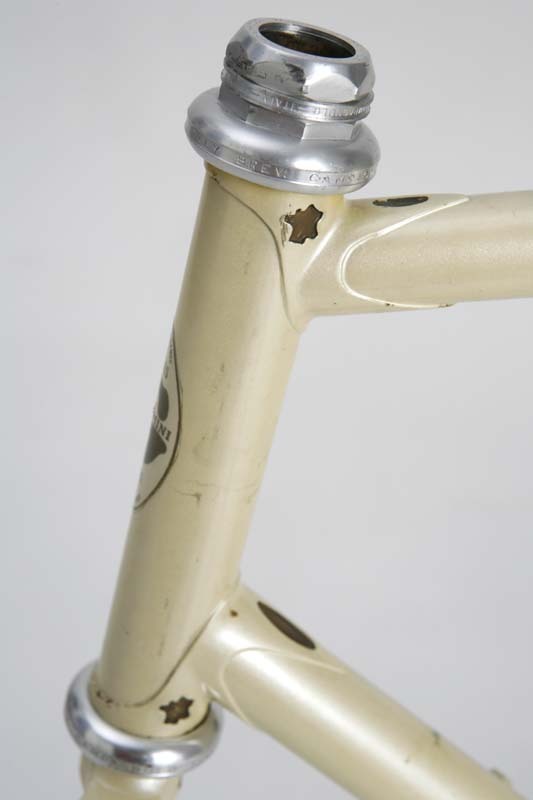 Cromwell Tiffany (Orica Ais) at 20"
10. Abbot Mara (USA National Team) at 22"
1. Vos Marianne (Rabo Woman Cycling Team) in 11h31'23"
2. Guderzo Tatiana (MCipollini Ale Galassia) at 1'31"
3. Hausler Claudia (Team Tibco To The Top) at 1'33"
4. Stevens Evelyn (Specialized Lululemon) at 1'39"
5. Moolman Ashleigh (Lotto Belisol Ladies) at 1'41"
Lampre-Merida was thrilled with their unexpected results of the Stage 4 TTT in Nice having finished 8th and only 25 seconds from winner ORICA GreenEDGE. 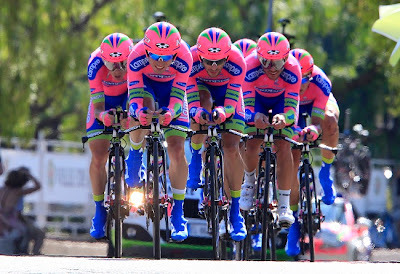 They attributed their success to riding a perfect TTT, one of the best performance ever by Saronni's team; the Merida bikes which they described as amazing and use of special cooling jerseys during their warm-ups provided by Champion System who is their jersey supplier. The end result of the impressive TTT is that Damiano Cunego, the team leader, didn't lose any major time to the GC contendors; he's only a few seconds behind Froome and Contador. If anyone still had any doubt, Marianne Vos in the 3rd stage showed everybody for the millionth time she's the strongest rider in the world. The Olympic and World Champion dominated the Cerro al Volturno - Cerro al Volturno (104.9) stage winning solo after showing all of her qualities on the flats, in descents and on the climbs. In one word: everywhere. Joining the Dutch champion on the podium were Claudia Hausler (Team Tibco To The Top) and Tatiana Guderzo (MCipollini Giordana), best Italian in the general classification, who both finished 45" after Vos. Fourth finisher was veteran, Fabiana Luperini (Faren Kuota), whilst fifth was the promising Rossella Ratto (Hitec Products Uck), now the best young rider. Vos: "After two second places in a row, I needed a stage victory! I didn't plan on making a long breakaway and I thought the stage wasn't so tough. The final was very steep and with the cobbles it was even worse, I'm really happy to win a stage in rosa. In the next days I hope to increase my advantage in the general classification." Guderzo, now 3rd GC: "I'm glad, I felt good in the race. I hope to continue to improve. Each stage has its own story, but I'm optimistic". Tomorrow's stage will be the longest of the Giro Rosa: Monte San Vito - Castelfidardo, 137.2 km, with a GPM of second category. 1st Vos Marianne (Rabo Woman Cycling Team) in 5h27'37"
I enjoyed the three days of images from Corsica for the first three stages of the Tour de France. 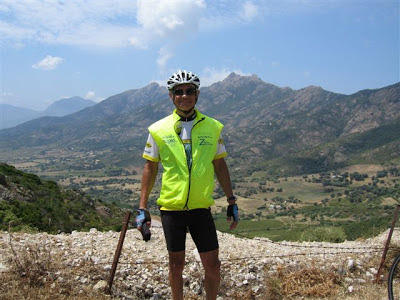 Several years ago my cycling club, Gruppo 1 of Verona, did a tour of Corsica. 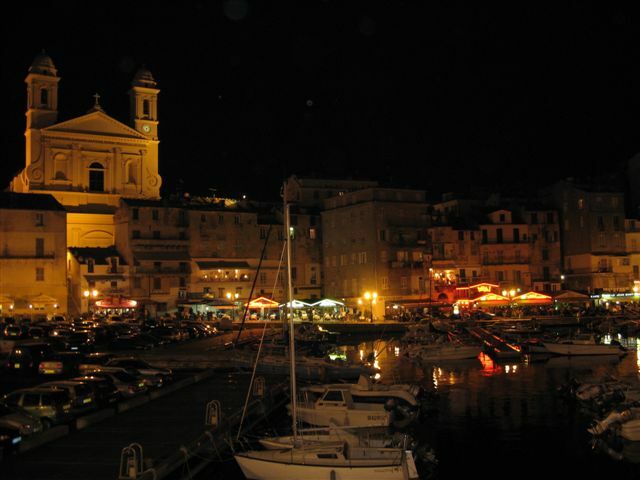 After driving from Verona to the port of Livorno we took the 1330 ferry to Bastia on the northeast coast of Corsica. We had a fabulous, sunny, day crossing the Canale di Corsica which connects the Mar Ligure and Mar Tirreno, arriving fours later. We checked into our hotel and prepared the bikes for departure the next morning before heading off to a seaside restaurant for dinner and a stroll around the harbor in Bastia.